We recognised that the kind of apparatus and equipment is dependent on the training objectives and the training contents of a particular task at work. 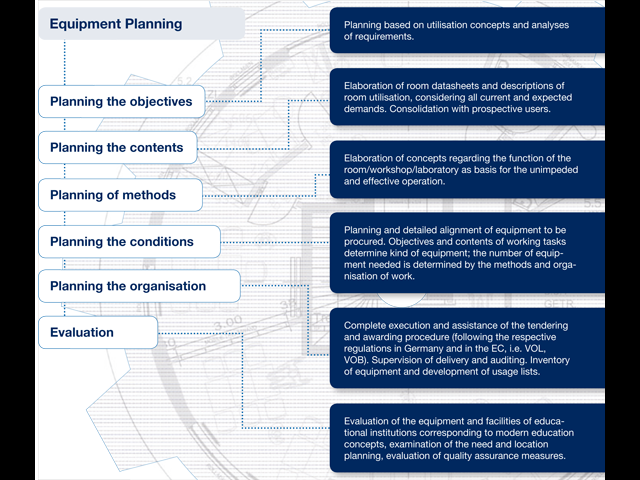 This finding is the methodical foundation for planning equipment. The quantity of apparatus and equipment to a great extent is dependent on the teaching methods selected and the organisation of the vocational education and training. DrKoernerConsult plans equipment and furnishings for secondary schools, technical schools, training workshops, vocational training centres, trading training institutes, staff training institutes, colleges and universities. DrKoernerConsult offers support in the planning of new training institutes and in the modernising of existing institutes. This also applies to advise in the acquisition and commissioning of the new equipment.